Wild West Slots brings back the days of yesteryear in the old west where sheriff's badges are wild, wild horses of three or more in a row wins the free spins, and sacks of cash get you to the bonus round. Wild West Slots is an awesome slot machine simulator that can also be played on Facebook and Android. Includes your favorite video slot features like exciting bonus games, scatter symbols, wild, and free spins. In Wild West Slots you'll experience the full scale of emotions just like a real casino player but you will like you are in a wild west saloon and you won't risk losing a cent! 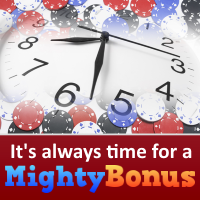 - Get bonus coins every few minutes. - Progressive Jackpot where the more you play the bigger it gets. - Listen to the the fantastic tunes that help transport you back to the saloons! Free 5 Reel slot game. Addictive gameplay, play on 5 paylines and enjoy winning! Lock 'n' Roll is an intriguing puzzle game requiring a combination of luck and skill. Roll four dice at a time and arrange them on a 4x4 grid. Receive points for various combinations according to number and color. You must place all four dice and once you lock them down, they are fixed in place! ..
Another old classic style slot game from Playtech. Alchemists Lab comes with 3x betting levels $1, $2 or $3 max. There is a maximum payout of 10,000 coins and unlike most classic slot machines it does come with a bonus round when you land 3x books on the single pay line. Another old classic slot machine from Playtech see’s Neptunes fortune provide 5 lines and 3 reels of betting action. There is nothing fancy about neptunes fortune other than the animated ship that bobs about at the top left of the screen. But For the classic slots enthusiasts, Neptunes Fortune cou..